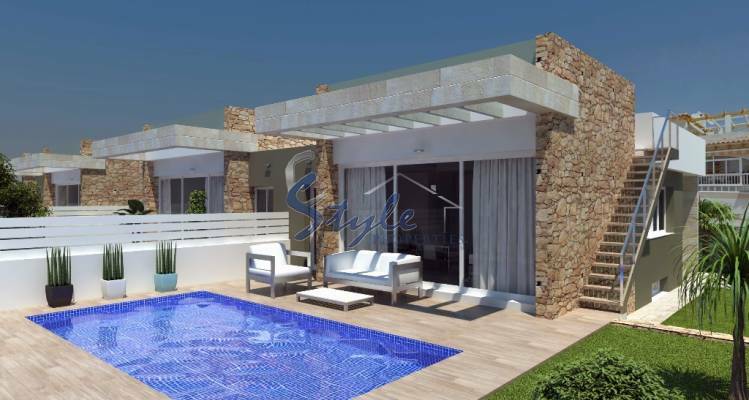 At E-Style Spain we provide you with the best range of properties on the Costa Blanca, so you should definitely talk to us if you are looking to buy a detached villa in the popular coastal town of Torrevieja. For the last 20 years we have been working in close cooperation with the best builders to bring our clients high quality residential developments. We currently have available detached villas with large terraces, solarium and garden. In many cases, there is room for a private pool. The villas are located within walking distance of a wide range of amenities and only a short drive from white sandy beaches and several golf courses. Torrevieja on the Costa Blanca South not only boasts a fabulous all year round climate but it is also a great location with easy access to the airports of Alicante and Murcia. Take a look at some of our detached villas for sale in Torrevieja and do not hesitate to contact us today for more details. Our team of specialists will be happy to guide you every step of the way!